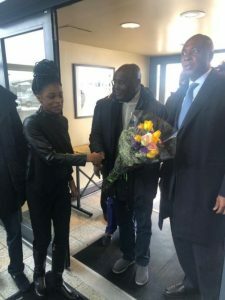 Former Vice president and main opposition candidate, Alhaji Atiku Abubakar has arrived in the United States. Atiku Abubakar will in the course of his trip hold meeting with US government officials, the business community and the Nigerian community, according to Ibe in a statement . Before his depature to the United States, Alhaji Abubakar met with the business community in Lagos at an interactive session to unveil his plans to get Nigeria working again. Alhaji Abubakar has not visited the U.S. since 2007 when he left as Nigeria’s vice-president. Former President Olusegun Obasanjo accused Alhaji Abubakar of fraud while in office, and he was also linked to corruption charges filed in the U.S. The politician denied all allegations of wrongdoing. For the over 12 years that Alhaji Abubakar was unable to visit the U.S. American authorities had declined to issue him entry visa and there were speculation that a secret indictment had been entered against him by that country’s authorities. Alhaji Abubakar returns to the country on Saturday.